Art-Punk, Progish-Psychedelia? The Ophelias are most accurately comparable to 1970-’71 David Bowie, Syd Barrett and early Pink Floyd, early Killing Joke, The Kinks, Led Zeppelin, Bob Dylan – mostly because of the harmonica – and The Mothers Of Invention. The singer, Leslie Medford, is highly idiosyncratic, making them “unmistakable” I’m sure. A good deal of the time he sounds slightly unhinged – as Ophelia the madgirl, perhaps. With warble and flutter reminiscent of Marc Bolan, Ray Davies or Blind Owl Wilson; Robert Plant-ish caterwauls, Peter Hammillian screams, and fragile sweetness à la The Incredible String Band; Medford’s vocals will not be ignored. I’m trying to be as accurate as possible here, because according to many The Ophelias were “weird”, and this perception of them as purposely strange impeded their career. I postulate that if they had been active in 1968-72 instead of 1984-89 there would have been no such perception and they would now be among the truly celebrated bands of rock and roll history. Medford tripped on psilocybin a lot, even on stage. The Ophelias smoked marijuana constantly and fairly guzzled beer. They were in their twenties and they were a real rock and roll band. The psilocybin does perhaps stand Medford apart and inject something genuinely Dalíesque, but certainly no moreso than Barrett’s mandrax, and none of the comparable bands listed above were anywhere close to “straight” musically or otherwise. Adventuring is at their core, as it is with The Ophelias. I do not mean to send the listener on a hunt to find echoes of other bands in the recordings made by The Ophelias. You can do that and find many other famous bands poking through here, there and everywhere. The Ophelias don’t settle into any one style, and while echoes of others abound, those echoes do not overwhelm the uniqueness of The Ophelias brand. In toto they don’t sound like anyone else, they sound like The Ophelias, a multifaceted, idiosyncratic, eccentric band…like all the best ones. The point is, for listeners who like the comparable groups mentioned above, and particularly to those who additionally enjoy smoking pot while listening, and most particularly to those who relish intelligence, adventure and unpredictability in their rock and roll, you will find something very special in The Ophelias. Should you give The Ophelias a real, devoted exploration? There are so many bands, old and new, one must use one’s listening time well, and often such tangents prove time consuming and unrewarding. Personally, I have The Ophelias among my 50 all-time favourite bands. The time I spend with them I consider well-spent indeed. I “managed” the ungovernable Ophelias for less than a year and I cannot say I came away completely unscathed. I was scathed by their sense of adventure. I was scathed by their madness. I was scathed by their music. And I was scathed when my visa got revoked, in part due to a what should have been a routine traffic stop complicated by the, oops, discovery of a small bag of psilocybin mushrooms on the back seat. Leslie Medford is truly one-of-a-kind and the entry of David Immerglück made them a true uberforce on the underground scene. Things were in real flux in the music industry at that time. I believe The Ophelias would have had a long career if they had been earlier or later, but they were too odd and uncategorizable for their time. They weren’t part of – or even close to – any fashionable musical trend or movement, and mid-eighties San Francisco was definitely not where they should have been. Europe certainly. And they still sound completely fresh. “Uncompromising” is probably not the right word for Leslie Medford. He was simply him. He was far out. Genius? Insane? I don’t know…but he knew what he was on about, and the force with which he lived made others – including myself – defer rather than advise. In retrospect I am sure I could have done more, and I’m sorry I didn’t. He deserved a long career more than almost anyone I can think of. 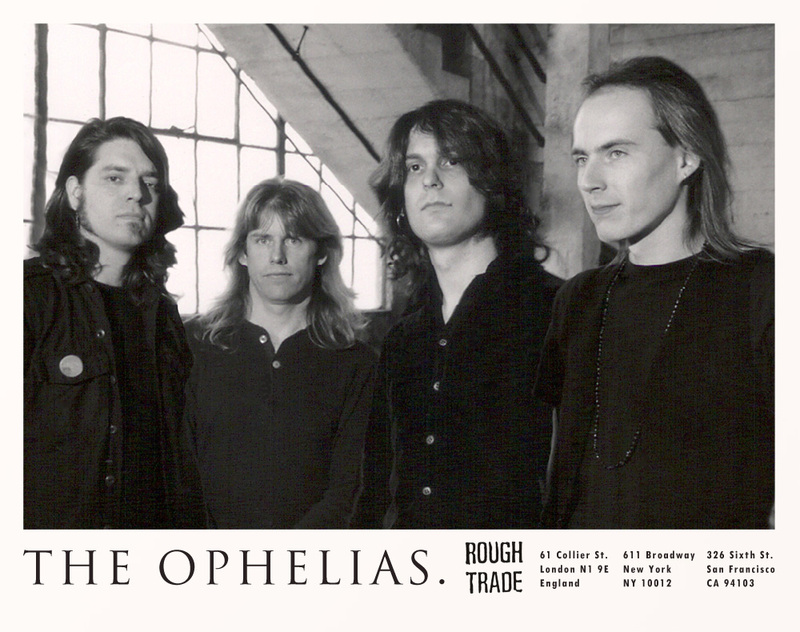 Being an Irish hippie The Ophelias reminded me of the great rock ‘n’ roll flights-of-fancy of my youth. Not so much specific comparables but the lot of the best intended, the real sparks, like The Incredible String Band, The Kinks, Syd Barrett, Daevid Allen’s Gong, T-Rex and Zeppelin, The Who, and the English art-punks like Killing Joke and PiL. 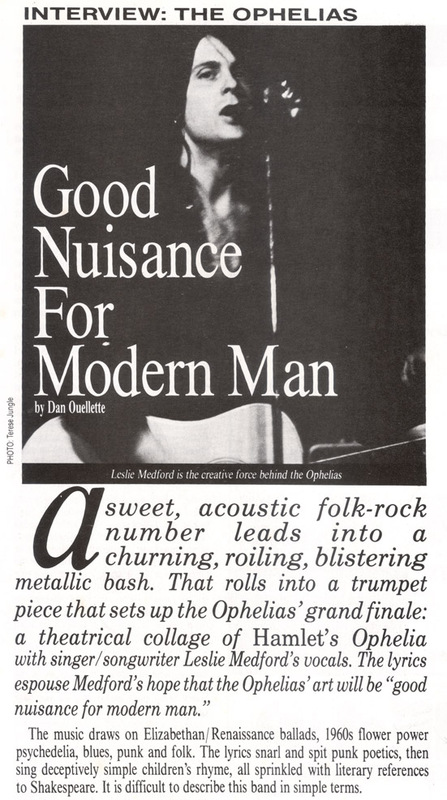 I know those are big names, and that Leslie won’t mind my bemoaning that he didn’t get there…but even with only a hat trick of released vinyl long-players The Ophelias blazed a brief, incendiary, serious shenanighan through the late-eighties. Sadly, Rough Trade UK remained ignorant to what they had in their roster. I am pleased to be invited to write a few lines of praise here. The consistency of the overdriven sonix of all this live performance material combines with just the right pacing to make this CD work as a single piece, and somehow illuminate the Medford method to the Medford madness. And I had no idea these recordings from a tour I helped arrange were extant. Extraordinarily inspired. There are about sixty cassette recordings of The Ophelias playing before the public; recordings that blow between unlistenable and pretty decent. Imagine that forty are unlistenable due to sonic problems with the recording itself (the recorder is too close to the bass, for instance, or too far away in the crowd) – or in the band’s performance (we were having an off night). The pretty decents – twenty then, say – cannot be called a large number, but tracks from this subset populate our live albums O List! and Green Girl. Another word, please, about these selections; it has to do with the amount of extemporaneous composition going on, which made The Ophelias unique in our place and time. On these two live albums more than a third of the words sung are being made up on the spot, likewise at least fifteen percent of the music, and several of the songs are being attempted for the first time. This is not jam band type improvisation, yet in live performance The Ophelias always ventured into improvisational performance art at key points, opening a set with an extemporaneous composition, for instance, or doing the same for an encore. Most of the best performance tapes feature a good deal of extemporaneous singing. Often I would improvise words on top of a fledgling song structure in hope of capturing on tape some spark of lyrical inspiration, or similarly surprise out a new song in a state of complete undress. Some of the vocalizing is embarrassing, sure, that’s easy to acknowledge. I was tripping, questing for something, and I refuse to be embarrassed by this. And in such a state remembering lyrics is a problem generally anyway. Point being: try not to mind the gibberishy bits. Ha! I like to think the lyrics got polished to a pleasing lustre eventually. Regardless, the singing comes unimpeded, with heartstrings and some inspired bandoleering! Further that…on Green Girl we’re out of the gate with an instrumental section of “The Big Myopian”, a four-pronged, psiloc-spurred gigue, never intoned this way again, magnificently into the breach…of “Lightning Tide” – extemporaneous – Ferrari and I launch into who knows what as Babbitt plugs in…and away we three go to the undiscovered country of November 1984. “Southeast Asian American Blues” combines two rehearsals. I chose to edit back and forth to get the best of Babbitt, and despite the resultant quirkiness I believe the song swings best because of what’s in and what’s left out. We now have entered the von Blankers & Chandler rhythm section period of The Ophelias; brief but spectacular! “There’s A Bell” is unhinged, “Exeunt: Janette With Baby And Ghost” slinks around; the latter combines two run-throughs from 19 March 1985. I created this version of “Exeunt…” using two cassette decks (editing without splicing) in the days immediately after this rehearsal, (and onto which I added the trumpet). We played “Exeunt” live while Babbit was with us, never after. “Mister Rabbit” and “Palindrome” are also from early rehearsals and in primitive form. That’s Reuben saying he got goosebumps from “Mister Rabbit”. Now two songs from our earliest public appearances, “When Winter Comes” and “Scions Of Toadies”. I never did write proper words for “Scions”, another song retired with Babbit’s departure. We set the general chordal and episodic arc of “Scions” in rehearsal, but this vocalizing is out there, off the cuff, with the band wobbling just right, and the center will hold. The rhythm section from “When Winter Comes” and “Scions Of Toadies” is von Blankers & Armour. 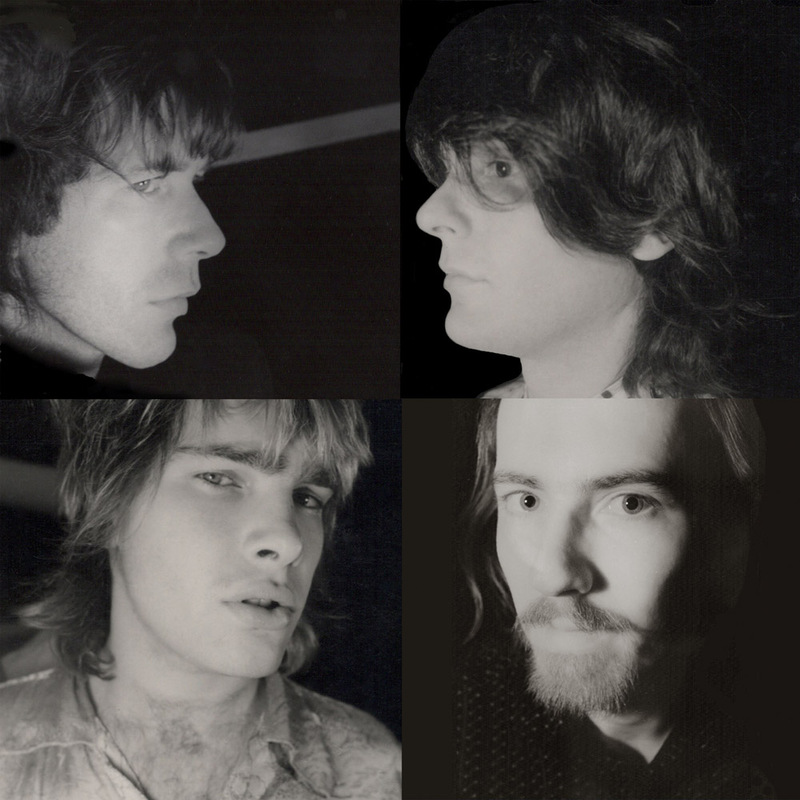 This continues with “New Society” illuminating the three-piece Ophelias line-up of summer and autumn 1986, which trio was just then recording other first album mainstays as “Palindrome” and “Nocturnal Blonde” at Dancing Dog Studio in Emeryville. On Green Girl “New Society” combines a pre-Dion alternative take, instrumental body, with a live four-piece version from several months thereafter. Dion solos, and von Blankers contributes astonishing New Societies towards the end. Next, the band that performs “Clash Of The Titans”, somehow, breathlessly, euphorically, survives its mad race around Metropolis, practically lapping itself. Clash was performed often. To moshpits and roistering hoodlums, we went cockadoodlums.“The Hanged Man” was fabricated on the spot by a marvellous Arabic concentration of vapours. My recollection is this: a night or two before the gig there was a rehearsal in which we played extempore, and we ended ebullient, thinking we were really onto something, and it was dubbed “The Hanged Man”. At the gig we go down a storm and come roaring to the end of our set, leaving the stage to great tumult, the place being packed. Dion had just joined so the positive reaction caused rejoicing among ourselves. We hadn’t saved anything for a possible encore; everything Dion knew we had already played. I suggested we try the Hanged Man idea as encore, and here is what resulted. My feeling on stage and immediately after was that my compatriots had not remembered how it went! Be that as it may we managed something luminous, and from that moment the song took on a life of its own. “Hanged Man I” is extempore, “Hanged Man II” from three weeks later is only marginally less so as “The Hanged Man” became our go-to freak-out ace-in-the-hole. Therefore, actually practicing it would have been counter-productive! We had a few other songs in the same category, “The Big (Myopian) Buck Boy Spins” foremost among them. I hope you can enjoy a double dose of Myopian: the Babbitt-infused Green Girl opener, now not exactly mirrored by this full on play-within-the-play Medford-vonBlankers-Armour-Dion clozer, which just may go off the rails! Deep breaths and, still, all can return to a semblance of nonchalance should we successfully transmogrify to the roots rock of the old T Rex, whereby the first Ophelias line-up communes once again with the Green Girl. Young and innocent days. First lines. Do you doubt that?